Update: The homily given my Fr. Mark Arnzen at Fr. Alex’s Funeral Mass is printed at the end of this post. Fr. Alex Affonso died early in the afternoon of Friday, December 13th, after a long battle with cancer. Beloved son of the late Martin Robert Affonso and Agnes Philomena Affonso, brother of Anthony Affonso (Jennifer), Arthur Affonso, Albert Affonso (Patricia), Alfred Affonso, the late Francis Affonso, Mary-Clare Affonso, Angelo Affonso (Linda), Agnello Affonso (Ramona), Christina Slate, Maria Picardo (Max), Anna Affonso (Georgie), uncle to several nephews, nieces, grand-uncle to nephews & nieces. Date of birth October 26, 1941, deceased December 13, 2013. A priest for 45 years, 11 months and 1 week. Formerly of the Archdiocese of Karachi, Pakistan from 1968 to 1993. Served as a pastor at various parishes in Pakistan for 25 years. A former Chancellor, Assistant Procurator, Vicar General, a Canon lawyer under Cardinal Joseph Cordeiro, had one of the finest Choirs in the Archdiocese of Karachi, Pakistan. Worked for many years amongst the lepers in the leper colony in Karachi, Pakistan. Upon his emigration to the U.S.A. in 1993 and after being incardinated into the Diocese of San Jose he served under the following capacities: as an associate at Church of the Resurrection, Sunnyvale from 1994-1997; he served as an associate and administrator at St. Simon Parish, Los Altos, from 1997 to 2007; as an associate at St. Catherine of Alexandria parish, Morgan Hill from 2010 to 2013, Chaplain at O’Connor Hospital, Chaplain at El Camino Hospital from 1997-2007. Lived the life of St. Francis of Assisi and Blessed Mother Theresa of Kolkata. Hobbies: loved nature, music, making kites, gardening carpentry, sports, was an athlete in 100 meters track champion. Also selected for the Olympics in field hockey. True till the end to his commitment to chastity, poverty and obedience. His last words on 12-10-2013: 2:45 pm: “I have learnt that sickness is very cruel. But with God and with the help of very close friends I can overcome those handicaps. One day all must pass through the door”. Fr. Alex’s Funeral Mass and burial took place on Friday, December 20, 2013. The following is the homily given at Fr. Alex’s Funeral Mass by Fr. Mark Arnzen, the pastor of St. Catherine’s Parish in Morgan Hill. Today we gather to give glory and praise to our God for the life of our brother and friend Fr. Alex Affonso. We are reminded through this liturgy of God’s great love for us and his promise of eternal life that Alex lived so beautifully in his life as a priest, brother and son chosen by God to serve. Our prayers are with his family, his mother Agnes, his brothers, sisters, nieces and nephews and friends gathered here today who mourn his death but we also come to celebrate with them our call to serve and to love. In a special way we thank our Bishop Patrick for celebrating with us today as well as Fr. Alex’s brother priests and deacons. We also thank the many friends of Fr. Alex who assisted him in his ministry and walked with him during his illness. The family would like me to especially thank Bobbi and Allan Smirni for their attentiveness a care for their brother. Alex was also blessed to have two wonderful sisters to care and look after him here in Santa Clara, Mary-Clare and Christina have been constant in the love a duty as sisters. The readings today, which Alex chose for us, are readings of hope, faith and love. These great virtues are part and parcel of how Alex as a priest and friend choose to live his life as a servant in the Catholic Church. Alex had that deep and intimate connection with our Lord Jesus Christ. He was unafraid to seek him out to ask the hard questions and with joy accept the invitation to follow him in the trust of truth and blessing in his life. He knew that God was present in his life and in the life of the world. He chose to serve and offer his life to show others the love of God and the hope of a greater blessing in the world. We all know Alex’s cross that he carried these last years of suffering, the numerous operations and the seemingly unending recoveries, a cross that even in the hardest and cruelest of times Fr. Alex carried with dignity and trust in God’s divine providence. As many of us know Alex’s family through his mother and father came to the Catholic faith at a great cost. The chose to follow in the footsteps of Jesus as the first disciples did, leaving behind a life of richness and security and discovering true peace and happiness in their call to love God and neighbor. The growing Affonso family took refuge in St. Patrick Church in Karachi Pakistan where they shared their gifts with their new Christian family and all who come to their door. This was a gift of generosity that Fr. Alex would continue to share throughout his life. Alex’s parents gave him and early example of how the sacrifice of the world offers a greater blessing for those who trust in our Lord. We know that Alex learned this lesson well in his life. Whatever community Alex was called to serve he did so with gusto and gave his total self to those he served. Fr. Alex excelled in school, both academically and in sport, and at the end of his high school studies informed in father that he would be going to the seminary. 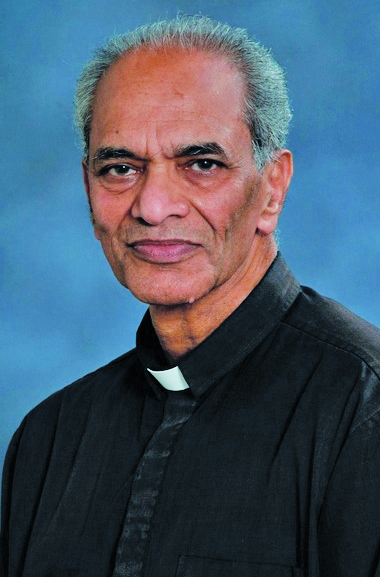 As the father of 12 children is was hoped that the eldest, Alex, would begin working to help the family but Alex’s faith and his call to the priesthood of Jesus Christ won the day and he entered minor seminary to begin his studies towards his ordination for the Archdiocese of Karachi in 1968. It may be hard to believe, but apparently Alex and his classmates were considered to be a little rebellious born out of the times and the wind of the Holy Spirit blowing through the Church in the years of the great Second Vatican Council. During this time Fr. Alex’s humility, obedience and desire to serve the people grew as he made each assignment, the first in the remote area of Lar Kanna to his work within the archdiocese in Karachi. Where Alex was sent, Alex served. As an excellent athlete in field hockey, sprinting and cricket, Alex left behind those glories to serve the greater glory of God’s call to priesthood. But I truly believe, from my friendship and service with Alex that he always desired to just be the simple priest, the man who served. I can imagine during his time in seminary that he studied and began to form himself through the beautiful encyclical of Blessed Pope John XVIII Sacerdotii nostri primordial. Blessed John XVIII reminded us all that the call to ordained ministry within the Catholic Church is a call to humble service. On the 100th anniversary of St. John Vianney, Pope John, outlined the life of a priest centered on service and the Eucharist, which were reflected in Fr. Alex’s priesthood. This was Fr. Alex’s life. Each of us has our own stories of Fr. Alex’s love for God’s people. When we announced his death at St. Catherine and family came up to me after Mass and talked about how he had shown their children how to fly kites. Now these parents spoke very little English but Alex’s love and generosity removed the language barrier as he made the children each a kite with his own hands, taught them to fly the kite and participated in their joy in seeing the kite soar into the heavens, this simple activity was a sign of how each day he lived in service of God, using whatever means to show the love of God to all. Fr. Alex’s wit and humor were subtle and understated. At the dinner table or in conversations Fr. Hector and I would often be taken by surprise with a comment that would bring laughter and joy to the table as Alex shared his unique insights. He saw he care for his garden, and he loved his garden, as one more way to serve by sharing the fruits of his harvest generously to everyone, sometimes even disappointing his pastor who had hoped for fresh vegetables only to discover that he had given them to a family in need, this was just one of the great signs of his pastoral care charism that marked so much of Fr. Alex’s ministry within our diocese. A care for God’s people that knew no bounds. During his first illness at St. Catherine’s, I was visiting him and during this time during our conversation he brought out a stack of index cards, on each card was the name of a person he had visited whom was home bound and family information that helped him be the good priest and visitor and these cards went back to the first visits he made as a parochial vicar at this (Resurrection) parish. We read in Fr. Alex’s obituary of his beautiful service to the Catholic Church in Pakistan what we didn’t read was that he did this service often at the risk of his life, surviving numerous attempts on his life, because of his Catholic faith. Underneath the gentleness of his life was a determination, even a stubbornness that in the love of God and his people made Alex continue to serve in face of these dangers. His life, centered on the Eucharist, was vital as you could find him daily in church praying his office and listening to the voice of our Lord. It was this determination and love of the Eucharist that helped him through the difficulties of his illnesses and relearning to speak after his reconstructive surgery on his mouth. When he was asked to take an accent reduction class I would see and hear him practice for hours so that he would able to speak more clearly in so doing serving God’s people more effectively. Trusting in the source of holiness, his Eucharistic life, gave him a graciousness that when I spoke with his instructor she shared that Fr. Alex was such a pleasure to work with and his kindness to her always made her look forward to speaking with him and working with him. These few words cannot express the fullness of his life but they, I hope, reveal that at the center of his life he was a priest, a man of God, and a brother of our Lord Jesus Christ. Was Fr. Alex perfect…no. (the stories we could all tell) Was he perfect in his desire to be love. I truly believe that was his one and greatest desire: to be love. Jesus reminds us in the Gospel today that he is the way, the truth and the life and if we believe in him we shall always share eternal life with him. Today we thank God for his priest, our brother Fr. Alex Affonso as we offer this Mass, this Eucharist in the sure and certain hope of the resurrection.